After completing my A Levels I took a gap year. I worked in an independent clothes shop for the year and gained vital workplace skills which helped to increase my confidence and social skills as well as giving me financial stability so I could leave home. During the year I worked to improve my knowledge of art history as I knew this was what I wanted to do at university the following year. 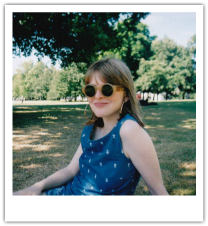 I visited all the exhibitions and galleries I could, volunteered at an exhibition at the Hayward and went on an art history Summer University course at the university of my choice. This work pulled off as I was offered a place at The Courtauld Institute of Art, a small art history only university based in London's Somerset House. I have just completed my second year there and am really looking forward to what next year and the future may hold. Studying photography taught me a lot about myself as an academic - that I much preferred writing and researching to the act of creation which lead me to the decision to take Art History at University. Whilst doing photography at A Level I was taught about a single period and style of art. Learning about this in such depth made me realise that this could be done throughout history, and I knew then that I wanted to learn as much as I could. Photography A Level also gave me an in depth knowledge of the early 20th Century and Surrealist period which has helped me no end whilst studying and writing essays for this period at university. After finishing my degree I hope to continue into a career within the arts. Ideally I would like to work on arts programming for the television, helping to bring art and art history to the public, making it accessible and enjoyable for all. At the moment I feel art history can feel like a bit of an alienating club, but through mediums such as film and television I believe it can be understood and appreciated much more widely. Having come from an entirely state educated background to now finding myself in frankly, a very elite institution, I would love to encourage all students, regardless of their previous education, to reach for universities and institutes such as Oxbridge and the Courtauld. If you have enough passion and determination it is completely possible, and I would argue necessary, for state educated students to attend elite universities.